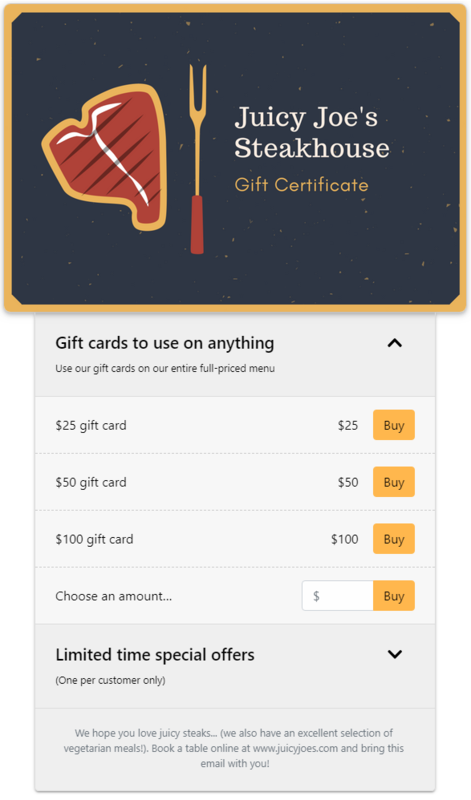 When you install our drop-in checkout on a page somewhere on your website, customers feel like they are buying your gift cards from your directly and they never have to leave your website. Installing the drop-in checkout in your website is our recommended approach. But if this is not possible, or you would prefer to link to a checkout we host for you, click here for instructions. We have specific instructions for all the major website builder platforms (including Squarespace, Wix, WordPress, Big Cartel, Ecwid, Facebook, Go Daddy, 1 & 1, and Weebly) but it will work on any website providing you can insert some HTML on a page somewhere. You can configure your checkout to only sell a subset of the items you generally have available, or set it to a specific language.